The house where I lived for four years during high school no longer exists. The ground where it stood is now a paved parking lot for the Methodist Church across the street. That church is why I was there. My dad was the preacher. We lived in the parsonage. 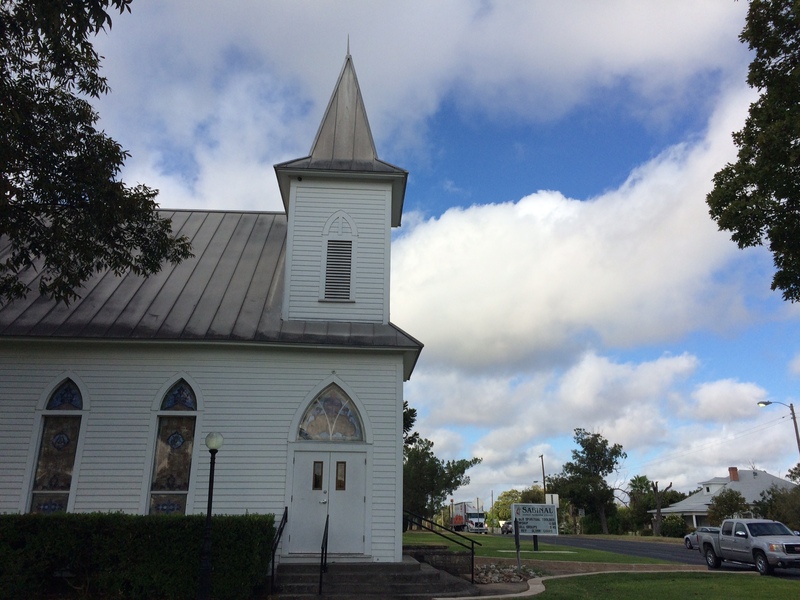 The church is still there, white and solid and pretty as ever, with its proud historic marker out front, its claim to continuity and care. The town itself looks much the same as I remembered it, only older and with a few things missing. The old train station is gone. It was where the whole town used to turn out for pep rallies on Thursday nights before the Friday high school football games. Trains hadn’t stopped there in years. The old Baptist Church is a ruin, but there’s a new one. I was back for a high school class reunion – our 50th. Like the town, we were all older and some members were missing. My folks had moved away shortly after I graduated high school, so I hadn’t seen these classmates in 50 years. It’s a strange feeling. We barely remember who we were back in high school and have no idea who each other is now. There were only 33 of us when we graduated; seven are gone. Out of the 26 remaining, ten of us showed up for the reunion. Others were too far away, in poor health, or had pressing obligations of family or work. “I’ve been thinking about how much things have changed in the past 50 years,” I said to one of my classmates as we departed for our respective homes, some farther away than others. “Yeah,” he said. “You know, in 1966 when we graduated, it was the class of 1916 having a 50-year reunion. They probably thought things had changed a lot, too.” That added a little perspective. We talked a while longer. He lamented the local schools having been taken over by the Mexicans. Not just any Mexicans – the Raza Unida ones. He said it was hard to get help on the farms and ranches anymore. Our hometown was now just a bunch of meth labs and addicts. Some people send their kids to distant towns – smaller towns – so they can get that good country schooling experience. Some people, he said, think about selling their farms and ranches. “But where would we go?” It was a tough question. I felt the distance between us. Not just the years, but the disparate experiences. I thought about the old story of the blind men and the elephant. We’re like that. We’ve experienced different slices and segments of life, so of course we draw different conclusions about what it all means. He told me about an encounter he’d had a couple years back with a “colored man” coming through town. There weren’t any “colored people” in our town. According to what my dad heard when we were living there, the last black people in the town had been lynched. This is where I went to high school. This is where I graduated 50 years ago. Things have changed a lot in 50 years. In some places more than in others.